LAST December an 8-second amateur video went viral. Shot in remote northern Tasmania, the blurry footage featured a long-tailed mammal trotting across a meadow with an oddly stilted gait. According to the film-maker, Murray McAllister, the animal was a Tasmanian tiger. 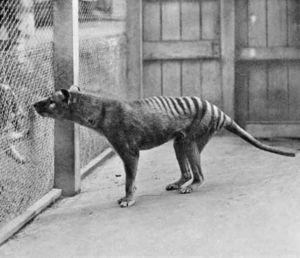 The Tasmanian tiger, or thylacine, is a wolf-sized marsupial predator that has been presumed extinct since the last known specimen died in Hobart zoo in 1936. Yet despite its apparent demise, reports of Tassie tigers refuse to die. Hundreds of sightings, many from seemingly credible observers, have been recorded, both in Tasmania and on the mainland. When I saw the video there was something vaguely familiar about it. Then it hit me: the animal moved like a red fox. I'd raised a fox as a boy in the western US, and they have a peculiar way of trotting. Soon, others were saying the same thing. Then a faecal sample McAllister collected was analysed for its DNA: it was a red fox. McAllister has been searching for the Tasmanian tiger since 1998. Though he might not describe himself as such, he is a cryptobiologist, a chaser of mythical, mysterious or supposedly extinct species. Cryptobiologists are a diverse lot, ranging from conventional scientists to eccentrics far from the mainstream. All share a dream of discovering elusive or unknown creatures unrecognised by conventional science - and with it their share of instant fame. Everyone knows about fabled creatures like Nessie and Bigfoot, but cryptobiologists actually chase a far larger menagerie of exotic beasts which they collectively term "cryptids". Some, like the Tasmanian tiger, clearly once existed. Others, such as giant vampire bats, conceivably might exist, having somehow escaped the attentions of conventional scientists. The third category, oddities such as the Jersey devil and the mothman, are strictly on the fringes. The more credible side of the cryptobiology crowd can be a pretty serious lot. Some, such as tropical ecologist David Bickford of the National University of Singapore and Aaron Bauer, an evolutionary biologist and herpetologist at Villanova University in Pennsylvania, are respected mainstream scientists. Bickford has discovered a number of previously unknown species, including a bizarre lungless frog that lives only beneath waterfalls in Borneo. The most committed cryptobiologists spend big sums of their own money to finance their quests. Being outside the realm of traditional science, they don't usually have a choice. For example, the late Grover Krantz, a physical anthropologist at Washington State University, invested around $50,000 for a light aircraft, infrared heat detector and other expensive gear in a decades-long search for Bigfoot in the Pacific Northwest. But for mainstream scientists, being a cryptobiologist isn't easy. Some have paid for their efforts in more than money. Roy Mackal, a dedicated chaser of Nessie and mokele-mbembe, an aquatic dinosaur that supposedly lives in the Congo basin, was booted out of the biology department at the University of Chicago; few if any dispute that his cryptid-seeking was the chief cause. Others endure sneers from their colleagues, a loss of credibility and even academic isolation. Why tolerate such treatment? "The search for the fringe and fanciful captivates many people," says Mike Trenerry, a biologist with the Queensland Department of Environment and Resource Management who uses automatic cameras to search for rare beasts. "We want to believe there is more out there than what we already know about." And the truth, of course, is that even in the 21st century, the natural world is still brimming with mystery. Tropical biologists commonly find that half or more of the insect species they capture in the rainforest canopy are new to science. Undiscovered fish and other species are frequently found in the deep sea. Up to half of all the plant species in the Amazon are still scientifically undocumented. Not all of the new discoveries are small or obscure. The Mindoro fruit bat, discovered in the Philippines in 2007, has a 1-metre wingspan. The same year saw the discovery of a venomous snakein Australia and a large electric ray in South Africa. And despite the misfire of the recent Tasmanian tiger video, there are many Lazarus species that have been rediscovered after having been presumed extinct. Until 1951, the Bermuda petrel had not been seen by scientists for 330 years. The Javan elephant, okapi, coelacanth, mountain pygmy possum, venomous Cuban solenodon and giant terror skink were also erroneously consigned to oblivion. The Laotian rock rat, discovered in 1996, is now the sole known representative of a rodent family that was thought to have vanished 11 million years ago. The Wollemi pine - the only known survivor of a 200-million-year-old plant family - was discovered in 1994 just a stone's throw from Sydney, Australia. It is the Lazarus species, perhaps more than any other cryptid group, that most inspire cryptobiologists. They give them hope by revealing that nature is still very much shrouded in uncertainty. From the coelacanth to the mountain pygmy possum, Cuban solenodon and giant terror skink, even dramatic species are sometimes wrongly presumed to have vanished. So we should celebrate the intrepid efforts of cryptobiologists. Yes, they chase bizarre creatures and flit around the fringes of conventional science, but we ought to appreciate their adventurous spirit rather than be disdainful. William Laurance is a distinguished professor and Australian Laureate at James Cook University in Cairns, Australia. He also holds the Prince Bernhard Chair in International Nature Conservation at the University of Utrecht, the Netherlands.